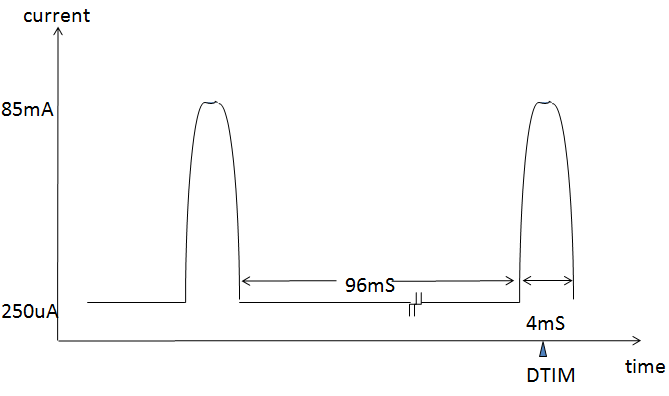 With transmit and receive currents on the order of 80-200mA, it's important to understand what options exist both within and beyond the 802.11 standard to power down the transceiver and extend battery life. This example shows a best case (lowest latency) DTIM period (n=1 – i.e. every beacon from the AP has a DTIM message). Transmit function is DUTY-CYCLED. Receive function is turned OFF. The table on this page summarizes the current consumption and power modes available for Microchip's current Wi-Fi® product offering.